I'm Not Skinny: 11-12-13 What I'm wearing. BURRRRRRR! It's cold! Here in the North East they are talking snow, which is awful because I hate the cold. I get the winter chill blues and since it's merely fall I wasn't ready for this cold front. To protest the chilly weather I decided to pull out some really bright accessories. 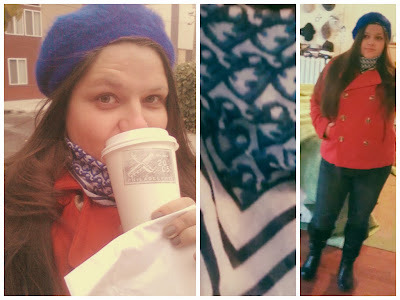 Cobalt blue beret, bright orange peacoat and my Christian Dior square scarf seem to have lifted my mood. My latte didn't hurt at all. Oh sweet delicious coffee you make my life worth living! How are you fighting off the winter chill? That is a rocking outfit. I have never had a pea coat but would like to someday. I need another A Line coat, too. Loved the one I had until the lining fell out of it.